Tuesdays@Belmont is a chance to get together for friendship, planned activities, games, a delicious home-cooked lunch and a thought-provoking ‘pause for thought’. Tuesday mornings 10.00am – 1.00pm during term time. Wednesday afternoon at 2.00pm in the Youth Hall. All welcome! 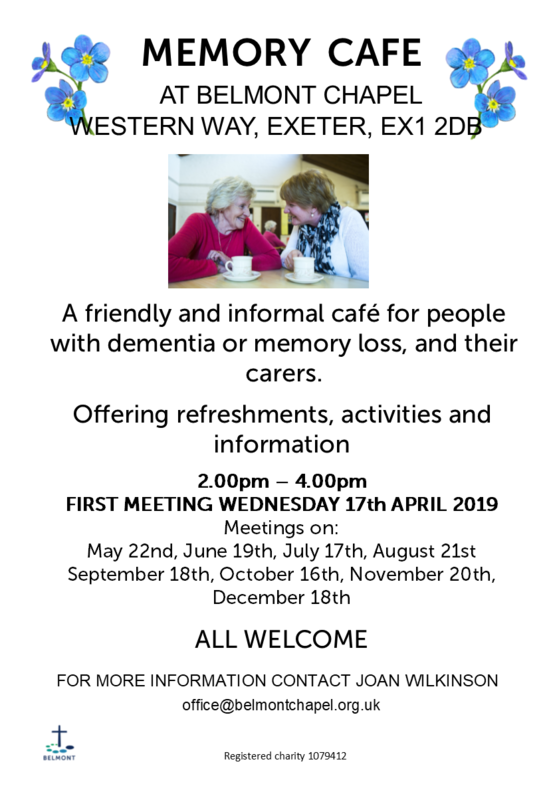 A friendly and informal cafe for people with dementia or memory loss, and their carers. Offering refreshments, activities and information. 19th April; 22nd May; 19th June; 17th July; 21st August; 18th September; 16th October; 20th November; 18th December.